To discover and develop gene-expression biomarker signatures for predicting airway inflammation, treatment responses and future risk of exacerbations of airways disease. Better diagnostic tests will inform clinicians on what is happening with the patient and what treatment will work best for them. To understand the mechanisms of neutrophilic inflammation in airways disease (neutrophils are a type of white blood cell) so we can work out how to treat it and improve people's symptoms. During my Biomedical Science degree I developed an interest in human biology and understanding more about what goes wrong in the body in disease states. I have always been a keen problem-solver and research suits my natural curiosity and thirst for knowledge. I continued with PhD study after finishing my undergraduate degree into asthma and have not looked back. The interplay between underlying genetics and environmental exposures in asthma and other airways diseases is fascinating. What's the ultimate goal for your research? To improve the lives of people with airways disease, through developing better diagnostic tools and targeted treatments based on active underlying mechanisms. Dr Katie Baines is a Level C Research Fellow in the Department of Respiratory and Sleep Medicine, HMRI and the University of Newcastle's Priority Research Centre for Healthy Lungs. She is an early-mid career researcher leading a molecular mechanisms group with a rising career trajectory. Her program of translational research involves applying innovative cell and molecular technologies to well characterised patients to allow a greater understanding of the underlying mechanisms, and develop diagnostic tools. Since 2009 she has over 50 publications, over 65 conference abstracts and 1 Australian Provisional Patent (PCT/AU2013/001466). Her research papers have been cited over 650 times (Scopus, H index of 14). Dr Baines has obtained 13 research project grants as the lead investigator, and 13 as co-investigator, amounting to over $3 million dollars, including 4 NHMRC Project Grants (2 x CIA, 1 x CIB, 1 x CIE). She has been awarded 4 post-doctoral fellowships since completing her PhD in 2008. There are several major themes to Dr Baines' research. The first includes the identification of molecular biomarkers as diagnostic tools for phenotype based medicine. This is based on the hypothesis that molecular biomarkers comprising gene expression signatures can improve diagnosis and management of airway disease through identification of phenotype, underlying mechanisms, treatment responsiveness and future risk. There are several areas in which she is actively pursuing the use of molecular biomarkers. These include predicting phenotype and treatment responsiveness of severe asthma, where she has defined transcriptional phenotypes of asthma using gene expression profiling of induced sputum and blood. 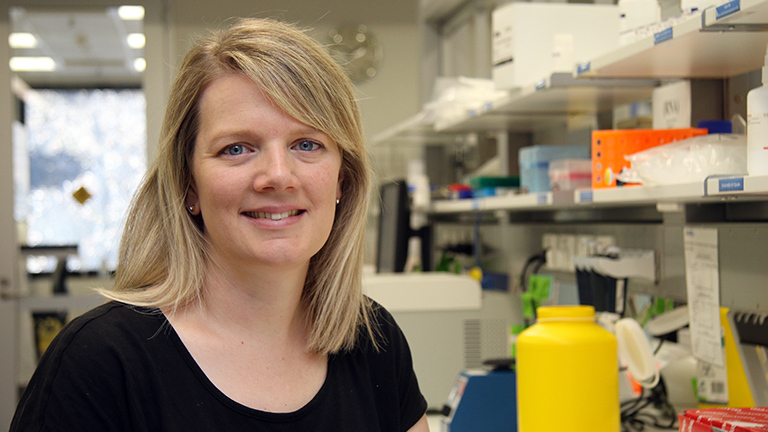 Dr Baines has defined a 6-gene expression biomarker signature as a diagnostic tool for phenotype prediction, which led to a Patent (PCT/AU2013/001466). She has furthered this research to show that these markers can also predict phenotype of COPD. The second theme is strongly focused on the role that neutrophils play in severe asthma and COPD, as current treatments are not successful at targeting this type of inflammation, and thus novel approaches are urgently needed. This is based on the hypothesis that enhanced NLRP3 inflammasome activation and neutrophil extracellur traps (NETs) are triggered by airway bacteria and lead to dysregulated IL-1β and airway neutrophilia in severe asthma and COPD.